Atop a hill overlooking Cuzco sits Saqsawamán. Commissioned by the Sapa Inka and built using tribute labor, the many interlocking structures of Saqsawamán served as fortress, palace and temple for the Inka. 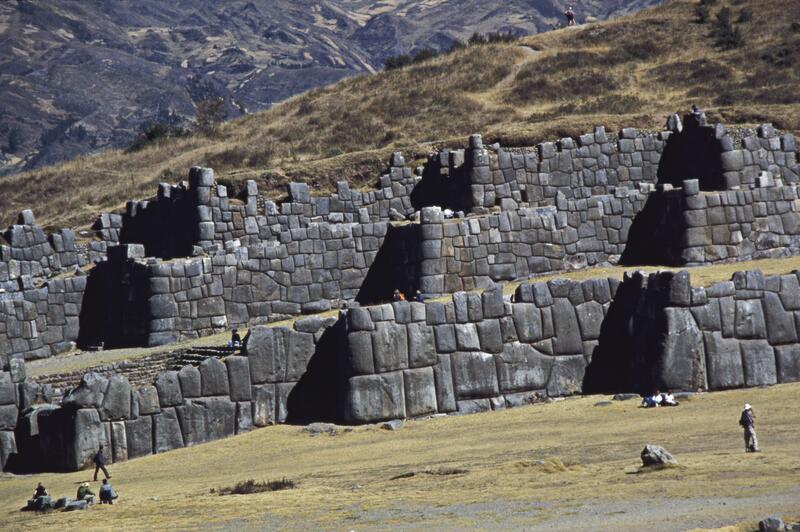 Its scale is massive, and the impressive zigzag walls exhibit the polygonal masonry for which the Inka were famous. The stones were cut individually and worked to lock precisely in place, as if they were puzzle pieces. The polygonal masonry required a monumental investment of labor. Some stones stand more than 15 feet high, and have been estimated to weigh two tons. The irregular appearance of these walls results from careful planning and skill. Inka masons cut and shaped each stone at Saqsawamán to fit into a particular place. While not the only polygonal masonry in Inka Cuzco, the massive size of these walls—and their resilience in the face of Spanish attempts to dismantle them—distinguish Saqsawamán from other pre-Columbian buildings in Cuzco. The Sapa Inka, the supreme ruler of the Inka state in pre-Columbian times, commissioned Saqsawamán. The actual dates of construction remain under debate, although it seems likely that either the ninth or tenth Sapa Inka, either Pachacutic or Tupac Inka Yupanqui, sponsored the project in the 15th century. The people who created Saqsawamán were male laborers. 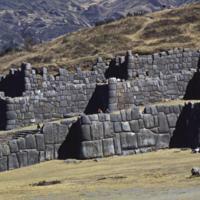 In fact stonework was one of the many obligations the Inka state required as tribute. Under Spanish rule, male laborers would have also been compelled to move stone for the new buildings of viceregal Cuzco. Saqsawamán was built of stone, with many of the adjoining stone surfaces cut and worked along at least five or six distinct angles (and at times, nine or ten). To create such complex patterns and to move such mammoth pieces of stone required hundreds of laborers, working for many decades—perhaps 50 years or more. The enormity of this project becomes even clearer given that no wheeled vehicles were used in building Saqsawamán, for the Inka did not use the wheel prior to the Spanish conquest. Some colonial sources suggest the walls of Saqsawamán were once covered with gold and silver. More certain is the fact that site served as the last stronghold of Inka warriors, as they struggled to fend off conquest by Spanish forces in 1536. After the Spanish took over Cuzco, parts of Saqsawamán were dismantled, and its stonework reused to build colonial Cuzco, including the Cathedral. ; Today, the site is an archaeological park. Each June, the ruins become a theater hosting a reenactment of the indigenous festival of Inti Raymi, a celebration that honors Viracocha, the Inka sun god. In the colonial period, Saqsawamán became a symbol of the city of Cuzco. One of the most famous battles between the Inka and Spaniards occurred at Saqsawamán in 1536. Inka warriors, under the leadership of Manco Inka, used Saqsawamán as fortress and stronghold, launching attacks on Spaniards corralled in the city below. Despite being outnumbered, Spaniards managed to rout Manco Inka’s forces from Saqsawamán, and eventually retook the city. Later in the colonial period, the image of Saqsawamán was incorporated into the coat of arms of the city of Cuzco. And descendents of Inka elites, perhaps seeing the site as the “last stand” of the Inka Empire, reclaimed Saqsawamán symbolically by using its image in their headdresses. The site thus took on a host of meanings—some overlapping, some contradictory—in the eyes of different viewers, be they native Andeans, Spaniards or Creole Cuzqueños. Angles Vargas, Victor. 1990. Sacsayhuamán: portento arquitectónico. Lima: Industrialgráfica. Dean, Carolyn S. 1998. “Creating a Ruin in Colonial Cusco: Sacsahuamán And What Was Made Of It.” Andean Past 5: 161-183. Gasparini, Graziano and Luis Margolies. 1980. Inca Architecture. Bloomington and London: University of Indiana Press. Lee, Vincent. 1986. “The Building of Sacsahuaman.” Ñawpa Pacha 24: 49-60.